theresa honeywell is a textile artist who is perhaps best known for her knit-wool reproductions of consumer products. 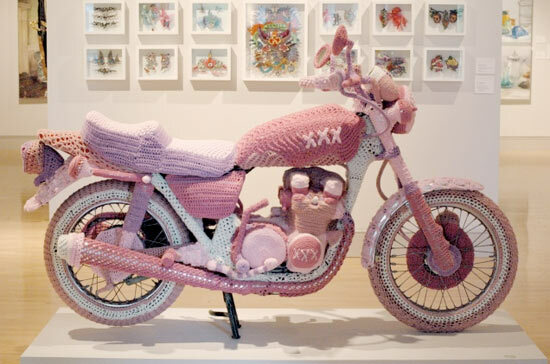 however, she has also knit a full-size cozy for a motorcycle and also has a series of reproduction tattoos made from fine lace. her soft textured projects often draw attention to their juxtaposition to the real hings. while a tool belt and machine gun are actually hard and tough in reality, honeywell’s reproductions are as soft and cozy as a teddybear.